The Beaver River Trestle south of Cold Lake is a highlight of the Iron Horse Trail. The trestle is 1/2 km long and 60 metres high. For winter family fun, Kinosoo Ridge Snow Resort features downhill skiing, snowboarding and a tubing park. It is North Eastern Alberta’s premiere downhill ski facility serving the area for 35 years. Nearby for the cross-country skier, you can rent equipment at Hamilton House B&B to enjoy 12 km of trails around the lake. 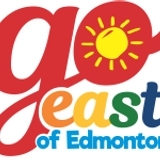 EAT SHOP STAY Find all your needs for shopping, dining and where to stay from downtown through the Highway 28 corridor in Cold Lake. Casino Dene is where you can play, dine, unwind, and stay. Over 250 slot and VLT machines, table games, and poker tournaments. Dine at the new lounge or grab a bite at Bistro Plus located in the Courtyard Marriott Hotel adjacent to the casino. It’s Cold Lake's newest hotel, so whether you are staying for business or pleasure, your stay will be more comfortable, productive and enjoyable. The Finishing Touch is a treasure trove of home décor with hundreds of unique items. They showcase the Kameleon jewellery line as well as the Simply Noelle clothing line. Gourmet food and kitchen accessories, giftware and artwork are also part of the offering at this beautiful store. See more EAT STAY & PLAY on Lakeshore Drive on the following page. 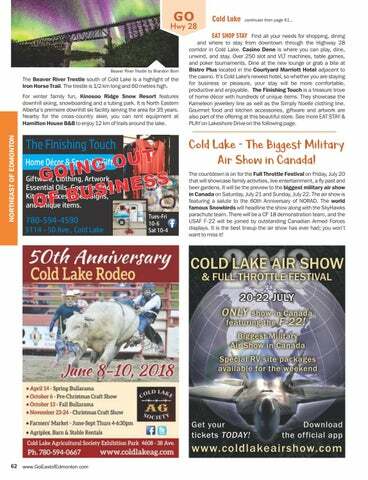 Cold Lake - The Biggest Military Air Show in Canada! The countdown is on for the Full Throttle Festival on Friday, July 20 that will showcase family activities, live entertainment, a fly past and beer gardens. It will be the preview to the biggest military air show in Canada on Saturday, July 21 and Sunday, July 22. The air show is featuring a salute to the 60th Anniversary of NORAD. The world famous Snowbirds will headline the show along with the SkyHawks parachute team. There will be a CF 18 demonstration team, and the USAF F-22 will be joined by outstanding Canadian Armed Forces displays. It is the best lineup the air show has ever had; you won’t want to miss it!